Dragon NaturallySpeaking 12 Professional enterprise speech recognition software lets users create documents and control their PC by voice — three times faster than typing — to drive productivity and cost savings. Create or modify documents, manage email, search the Web, or automate business processes. Even dictate into a digital voice recorder or compatible iOS device and Dragon will transcribe the audio files. 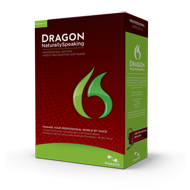 Dragon Professional is the ideal solution for corporate professionals who want to work faster and smarter.